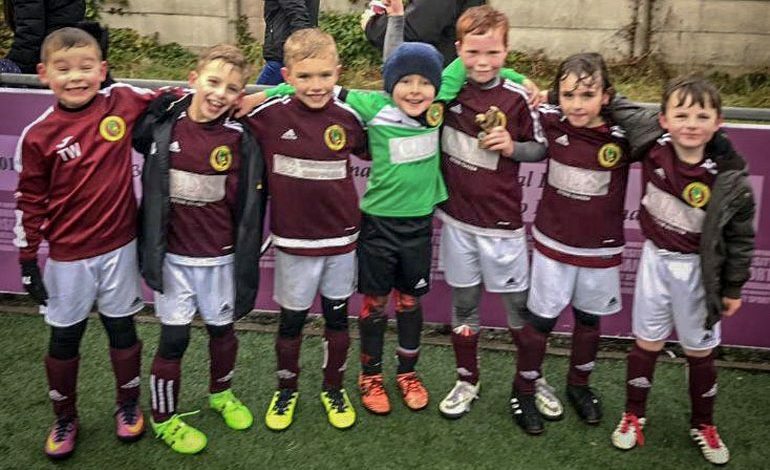 The persistent wet weather led to some cancelled football matches for Aycliffe Juniors this weekend. The Saturday teams managed their games but then on Sunday several teams had games postponed. The Under 6’s and some of the newer Under 7’s players enjoyed the indoor facilities at the Alun Armstrong Centre for a joint training session. Great football was played and some superb goals were scored. The Under 7’s White played on Saturday and were in great form. A hatrick from Jack C and two goals each for Jack R and Tyler. With Will, Joel and Ryan Lee also scoring in a comprehensive 10-0 win against Pass Soccer Reds. This was a great team performance and Joel was the man of the match. The Under 8’s played their cup game at Boro Rangers. The effort did not get the result it deserved with man of the match Harry Dunn and Jack Heron scoring in an 8-2 loss. The development game was a high scoring affair but ended in a 9-7 defeat. Alex (3), Logan (2), Harry and Sam were the scorers. The Under 11’s Black played away at Bedale and returned home happy after a 7-4 victory. They were behind early in the game but came back and ended the first half 5-2 ahead. After Bedale had got back in to the game both Jake and Rhys completed their hatricks to seal the win. Jayden also scored and Jake Smith was the man of the match. The Under 12’s had a thrilling cup tie at Kader. They came from behind twice with Zak and Daniel scoring to make the final score 2-2. In the penalty shoot out Zak, Charlie, Daniel and Jake were on target with Noah making two great saves to win 4-3 and seal a place in the quarter finals. Charlie was named as the man of the match. The Under 13’s Russell Foster League team played on Saturday but suffered a 3-0 defeat away at Foundation of Light.